At 7pm UK time on Sunday (yesterday), I did the first Zork live stream. This post is going to look back at how this went, from a technical point of view, from my point of view as a new YouTube streamer, and from the point of view of a non-adventure gamer playing Zork for the first time. There was two aspects to the hardware. The RC2014 running Zork was almost completely stand-alone. 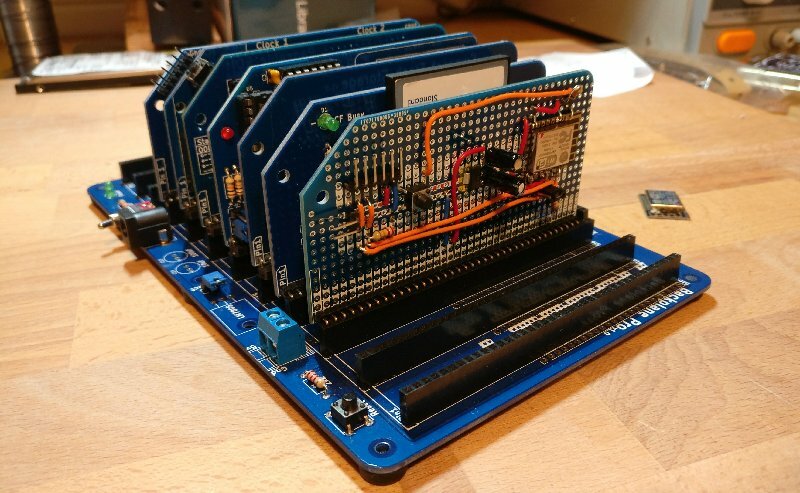 It had it’s own keyboard and monitor, and the only connection to the outside world was via the ESP8266 module. The ESP connected to the internet over Wifi, and streamed everything that was sent to the monitor via web sockets. The Tx line from the ESP also went to a laptop so that I could monitor how many connections were open. The laptop was also running Wirecast, and streaming it’s webcam and microphone to a live (live-ish. About a 10 second delay) YouTube feed. I could then talk, mumble, gesture, or use the chat feature, as well as read the chat messages as they came in. Although I had loaded up Zork a few times in the past, I had never gone further than randomly typing in directions, or going in to the house. So I really was treading new ground here. One of the things that surprised me for a 40 year old game is just how large the place is, and how much is going on. I didn’t realise that there would be other characters that moved around, stole things from you and dropped things in different rooms. The first game didn’t last too long, after picking a fight with the thief left me injured and a troll finished me off. So I restarted the game, and decided to take a different approach in attacking the thief – but was surprised to find he wasn’t where he was in the previous game. I did find myself questioning my motives here though. Basically, I broke in to somebodys house, took all of their possessions, and tried to kill the first person I met. I should be asking myself who the bad guy is in this game! I had downloaded a map from the internet to make things a little bit easier for me. It saved me from trying to go in directions that didn’t exist, and meant that I didn’t have to map things out for myself as I went along. However it didn’t mean that I could just get to where I thought I wanted to go. For example, once I went downstairs from the house, I couldn’t get back up again. Well, one way up was up an unclimbable slope, one was up through the trap door that was locked behind me (probably by the house owner after I stole his lunch), and the stairs to the kitchen could only be climbed if I dropped most of what I was carrying. Eventually I ended up at the Dam, and there was a control panel with a bolt and a green bubble on it. In the Maintenance Room I found a wrench. Also a tube of magical gunk. So, surely these things were all related, and something good would happen if I could remove the bolt. But no matter what combination of words I used, it just wouldn’t do anything. door here, and all the windows are boarded. window which is slightly ajar. have been used recently for the preparation of food. A pasing on the table. The door is nailed shut. There is a table here. have noticed an irregularity beneath it. floors are splattered with paints of 69 different colors. of the walls here. He does not speak, but it is clear fromaspect that the bag will be taken only over his dead body. The thief is a strong, silent type. I don't know the word "theif". What do you want to kill the man with? I don't know the word "kindness". I don't know the word "l\kill". The thief is confused and can't fight back. The thief slowly regains his feet. Your stroke lands, but it was only the flat of the blade. You can't see any man here! You can't get up there with what you're carrying. The trap door is closed. Empire, a self-contained and self-maintainie operation. Only Santa Claus climbs down chimneys. Which door do you mean, the wooden door or the trap door? There is a glass bottle here. There is a rope here. There is a ZORK owner's manual here. The troll isn't much of a conversationalist. The troll fends you off with a menacing gesture. That would involve quite a contortion! passages out of the room. The flat of the troll'Conquering his fears, the troll puts you to death. Your score is 29 (total of 350 points), in 91 moves. by vandals with exceptional taste. The vandals left tainting of unparalleled beauty. Your load is too heavy. ZORK owner's manual: The brown sack isn't open. leaflet: The brown sack isn't open. glass bottle: The brown sack isn't open. glass bottle: There's no room. brown sack: How can you do that? nasty knife: There's no room. Thank you very much. It really hit the spot. sword: There's brass lantern: There's no room. You'll have to open the glass bottle first. Your sword crashes down, knocking the troll into dreamland. too deep and wide for crossing. The stream emerges from a spot too small for you to enter. It is an integral part of the control panel. There's nothing special about the green bubble. There's nothing special about the bolt. I don't know the word "oxy". I've known strange people, but fighting a bolt? There's nothing special about the pile of plastic. There's no good surface on the green bubble. that they crumble when you touch them. It is now pitch black. was quite a tourist attraction in times far distant. I don't know the word "undo". Pushing the bolt isn't notably helpful. You can't move the bolt. The bolt won't turn with your best effort. There is an object which looks like a tube of toothpaste here. I don't know the word "toothpaste". There's no good surface on the bolt. I don't know the word "loose". Pushing the green bubble has no effect. was quite a tourist attraction in times far distant. TheThere is a sword here. was quite a tourist attraction in times far distant. TheThere is a brown sack here. If you pray enough, your prayers may be answered. The YouTube stream can be found here https://youtu.be/Gdjq2Rb9y64 But, really, it’s probably not going to be one of those thing I expect anybody to sit through! The initial testing of the ESP8266 board with the RC2014 was pretty good, and fundamentally it worked. However, it wasn’t quite right, and I suspected that the problem was to do with CR or LF. The code I was using was found here; https://github.com/tzapu/WebSocketSerialMonitor (Thanks Tzapu!). It uses web sockets, and allows an external web page to connect through to the ESP8266. So, by going to http://tzapu.github.io/WebSocketSerialMonitor/ and connecting to ws://x.x.x.x:81/ws (where x.x.x.x is my external IP address and a firewall rule is set up to forward port 81 through to the internal address of the ESP) it will display everything the ESP receives on its Rx pin. Well, almost everything, but not quie everything. If, for example, I did a directory listing which was 2 full lines and a little bit more on the 3rd line, only the first 2 lines would show up. If I’m playing Zork, sometimes it would show the whole chunk of text as it came in, other times it would miss the last line. But, sadly, it didn’t. If anything, it made it worse. So, instead, I tried just reading a set amount of characters (10 initially) and sending them regardless of a CR or LF, but that didn’t work either. When I got it to send every character without checking, it worked much much better, although if I sent a very large chunk of text it would miss random bits of it. Much simpler, and it seemed to work perfectly! All the testing up until this point was done either on my laptop or mobile. Although they are on the same wifi network as the ESP, it’s connecting out to an external web page before coming back in, so it should be a reasonable test. But there’s nothing like real people connecting in to really see if it works. So, I put a shout out on Twitter, and on Saturday evening, 4 willing volunteers sat there watching me do random things on the RC2014. I messed about with simple programs in BASIC, directory listings, and the opening moves in Zork, with success. In a moment of madness, I fired up Wordstar. When the RC2014 is connected to a VT100 terminal, it works great by using escape codes to set where things are on the screen and what colours are used. However, these escape codes don’t render at all well on the web sockets interface. Thanks Dave for showing my just how bad it looked! So, yes, I should have known that Wordstar would be pushing it a bit far. But otherwise, I was very pleased with the performance. The biggest problem I had, though, was that of feedback when interacting with the “audience”. I could type short sentences in to Zork that the viewers would see and understand, even if the Zork engine couldn’t interpret it. But, of course, there was no live feedback from the viewers. I’m not sure what the solution to that will be, but it could be as simple as keeping Twitter open on my phone. Alternatively, things like IRC or Slack could be used (although I don’t want viewers to have to jump through hoops to get connected to me). Skype might be an option too, although, at the moment, I think it’s more likely I’ll set up a YouTube live stream and use the chat feature in that. For those wondering about the set up that I’m using, it’s pretty much a stock RC2014 Pro with a Pi Serial Terminal and the ESP8266 prototype I built for this project. The Pi Zero is connected via a HDMI > VGA adapter, and then to a 17″ monitor. The keyboard is this Cherry keyboard from the last Retro Challenge. Note that the key layout is sufficiently different from what I’m used to that typos aren’t too uncommon yet. The laptop is there to program the ESP, and to monitor it’s output. I am aiming to have a live run through on Friday, so that gives me a few days to look in to the feedback options.